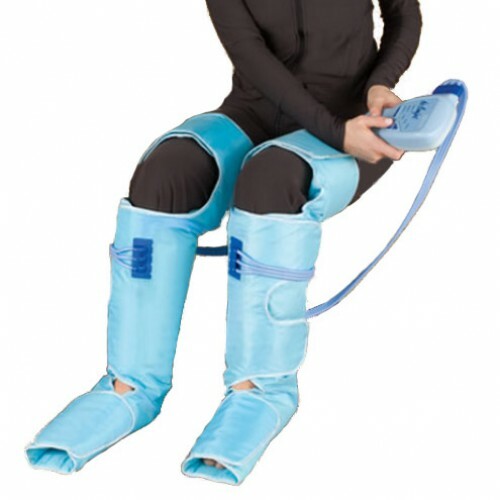 The Circulation Improving Leg Wraps are used for Compression Therapy to improve circulation in the legs. Manufactured by Nitring, the circulation leg wraps come with two Compression Leg Sleeves that soothe achy legs and swelling. The Leg Compression Sleeves have six airbags built into a leg garment that is wrapped around the entire leg and inflated and deflated to help blood vessels expand and contract. The compression intervals of the Nitring circulation leg wraps stimulate circulation in the thighs, hamstrings, calves, and feet. The Intermittent Compression provided by the Compression Pump with Circulation Improving Leg Wraps help facilitate blood flow back to the body from the lower extremities. The circulation leg wraps compression pump comes with a corded remote that allows you to select from three levels of intensity. Used by hospitals as well, the hospital circulation leg wraps offer the choice between seven compression programs that pinpoint different areas at varying intervals. The Compression Wraps have adjustable Velcro® closures that offer individual adaptation. Lightweight and portable for traveling. Adjustable Velcro® closures to meet individual needs. Does it have sequential compression? Hello Mrs. Nelson, The system is not battery operated. It requires the user to plug the machine into an outlet. The pump also has sequential compression. Is this device covered by medicare with a doctor's prescription? Hello Roz: In an effort to keep our prices low, we do not work directly with Medicare, unfortunately. Would this product work if brought to Europe and a universal adaptor used? For specific questions regarding operating the item in Europe, it's best to contact the manufacturer. Where can I purchase just the pump. You may purchase through our website at vitalitymedical.com or make a purchase over the phone with one of our customer service representatives. Please give us a call at 800-397-5899 for further assistance. Are there compression garments for the arms? This particular compression pump is only for the legs. We do carry arm sleeves; however. Do you accept Medicare or Medical insurance ? Can you deliver ? In an effort to keep our prices low, we do not bill Medicare or insurance companies. Feel free to contact Medicare for information about reimbursement. We are able to deliver items anywhere in the U.S. and abroad. I have restless leg syndrome and I am wondering if this would be helpful for that condition. Do these help Restless Syndrome? My primary is MCA but my secondary is Horizon NJ Direct 10. Will pay for the device? We do not employ any medical professionals and therefore cannot answer any specific questions regarding this item. We recommend speaking with a medical professional and the manufacturer to get the right fit for your needs. Any information as to the use for lymphedema therapy purposes? Instructions for use are included with every order. Check with your doctor to determine if these wraps will be enough for your condition. I purchased this product 3 months ago. My unit completely stopped working. When I called Vitality they said there is no warranty at all. The leg wraps work fine but the main compressor unit doesn't come on. I found I could not wear compression hosiery because of a wound on my leg due to the disease. I bought this device and it works better than the bandaging and lymph massages. I like it so much that I recommended it to my doctor for his Lymphedema patients. I do two treatments a day; but, I think one would be enough. Contrary to one review, I found the instructions very clear and easy to follow; however, when I first used it, I did not read the instructions and got it to work perfectly. Overall, I am very satisfied with this product. My only suggestion is that more Velcro be added so that the leg wraps fit more snug around slender legs. These are good to help circulation, but they don't compress as much as the hospital version. Because they come all the way up to your thighs, they are quite warm. Just starting to use on a regular basis to help with foot and leg edema in both legs. I should use it for several more weeks and then will be in a better position to offer a more detailed review. This is a great product - it's gentle, not too strong, doesn't cause any pain and makes my legs feel great. It is easy to store as you can fold the wraps + the pump is really small. I am a final semester nursing student, currently working as a patient care tech full weekends, while I am in school. 12 hour shifts involve a ton of walking, and very little time to sit down. After a long shift, I come home to tired legs and feet, despite good compression stockings. This version of SCD's is my go-to once I get home, to get relief from leg and foot pain. It provides firm compression cycles, and with 7 different compression programs, I can select exactly the area and degree of compression to gain relief. I have recommended this set to my fellow nursing students, and to the staff at hospital! It is very well constructed, and sturdy, and affordable!!! Overall I am satisfied with this product. I agree with one consumer that it would be a benefit to be able to use only one sleeve at a time. Very pleased about having only 3 buttons to operate all functions. My brother went online and found this product and I ordered it immediately it does work perfectly you can separate the two legs and if you wish to use just one leg. It just requires reconfiguring the hoses. I use it on one leg all the time but set aside the other leg in case I want to use them both. It came with a packet of instructions and the packet was sealed in a plastic bag in the box. I would recommend this product to anybody who has fluid buildup in their legs called lymphedema and after one or two uses I noticed that my leg was back to normal. Lymphedema is an ongoing condition so your money is not wasted because this product can be used over and over again. If you have a loved one with this condition I recommend this company completely.